A gorilla onesie wearing thug who bit part of a mans ear off - after chomping on a dog’s ear - has been jailed for more than three years. Craig Lines attacked Leigh Bray and his dog in the brutal assault in Farcet last year. Mr Bray lost the tip of his left ear in the assault - and was also left with serious leg wounds after he was dragged by a car along the street as Lines’ wife, Lauren Poole, drove from the scene. At Peterborough Crown Court Lines (34) and Poole (33), both of Marshalls Way, Farcet, were jailed for their part in the incident by Judge Sean Enright. 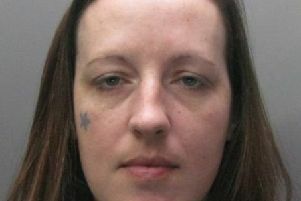 Lines was locked up for three years and three months after pleading guilty to inflicting grievous bodily harm and criminal damage, while Poole was jailed for a year after a jury found her guilty of dangerous driving following a trial. Jonathan Masters, prosecuting, told the court Mr Bray had gone to see Lines on June 24 as he owed him money. He said when he arrived at 6.45pm, Lines - who the court was told was wearing a gorilla onesie without the headpiece - went over to Mr Bray’s van, and smashed the passenger window. He then picked up Mr Bray’s dog, a Jack Russell named Beans, put him in a headlock, and bit the dogs ear. As Mr Bray got closer, Lines stopped biting the dog, he leaned in and bit Mr Bray’s left ear. Mr Masters said the bite caused ‘a massive amount of pain’ and witnesses described blood pouring from the wound. At that point Lines’ then girlfriend - and now wife - Poole arrived, and after threatening to stab Mr Bray, she used her Smart car to pin the victim against another car. Mr Masters said the victim was ‘surprised’ his legs were not broken by the incident. Poole then drove off, with Lines getting in the car with Beans. But Mr Bray clung on, with the front passenger door open, and was dragged 40 metres up the road, with his feet flailing on the floor. Lines was arrested two days later after sleeping rough. Mr Bray suffered serious scrapes on his legs - some as deep as the bone - and his ear was permanently disfigured as a result of the bite. Diane Mundell, defending, said Lines had suffered depression and other medical difficulties - including taking an overdose in January. Liam Varnell, defending Poole, said his client had two young children, who should not lose out as a result of a custodial sentence, appealing to Judge Enright to suspend any jail term. But Judge Enright said the offences were so serious only a custodial sentence was appropriate. Along with the 12 month prison term, Poole was disqualified from driving for two years. Both Poole and Lines were given a restraining order banning them from contacting Mr Bray for 10 years.